These cemeteries have so much history, it&apos;s spooky! In 1896, the founders of Oakwood University purchased land from the former plantations operated by Peter Blow and Job Key. For years, a slave cemetery was believed to exist somewhere on the property but the exact location was unknown. In the 1990s, local historian and cemetery expert Tom Kenry found the documentation and location of the cemetery. Around 40 slaves were buried in the little cemetery. Though the cemetery was located on Key&apos;s property, slaves from both plantations were buried in the cemetery. A monument and marker stand as testament to the importance of the site and as a testimony for the people buried within. The first wife and two children of Dred Scott, who sued for his freedom in the U.S. Supreme Court in 1857, are believed to be among the 40 graves. Scott and his family were owned by Peter Blow until the Blow family moved to St. Louis, Missouri and sold Scott to Dr. John Emerson. Tucked in between two houses on Siniard Drive sits the Hobbs Family Cemetery. 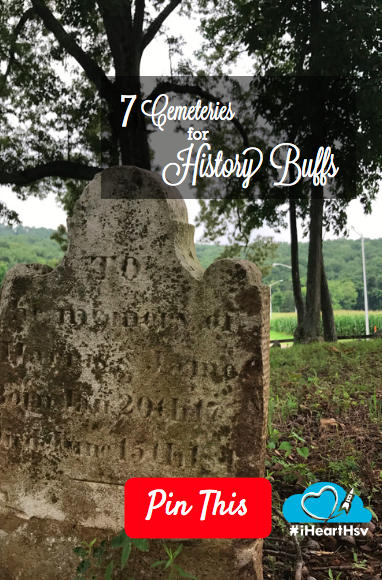 The cemetery boasts what is believed to be the oldest headstone in Madison County and is the final resting place fore than 20 people including John Hobbs (as in the man who owned Hobbs Island. His brother, James Fennell, is also buried there. I hope the two men were close in life because they are even closer in death...) James Fennell died in 1817 and was originally buried in another cemetery. Hobbs died in 1834 and was buried in the family cemetery. Sometime after Hobbs died, the family decided to move Fennell&apos;s grave to the Hobbs Family cemetery and picked what they thought was a vacant, unoccupied spot without a headstone. But guess what... turns out, it was very much occupied but it was too late! You guessed it, James Fennell was re-buried on top of his brother-in-law, John Hobbs. Fennell&apos;s 1817 headstone, the oldest known headstone in Madison County, was also moved to the Hobbs Cemetery. The Harris Hill Cemetery houses folk instrument in the formation of both our country and of our state. Harris Hill was the family cemetery of Francis Eppes Harris, a Revolutionary War veteran. He&apos;s not the only Revolutionary War vet though, Colonel Efford Bentley is also buried there. And if you are super excited to celebrate Alabama&apos;s bicentennial (www.alabama200.org) coming up in 2019, here&apos;s the resting place of someone who helped make Alabama " a thing." Lemuel Mead was one of the Madison delegates at the constitutional convention and one of the original signers of the 1819 Alabama Constitution. Thanks, Lem! 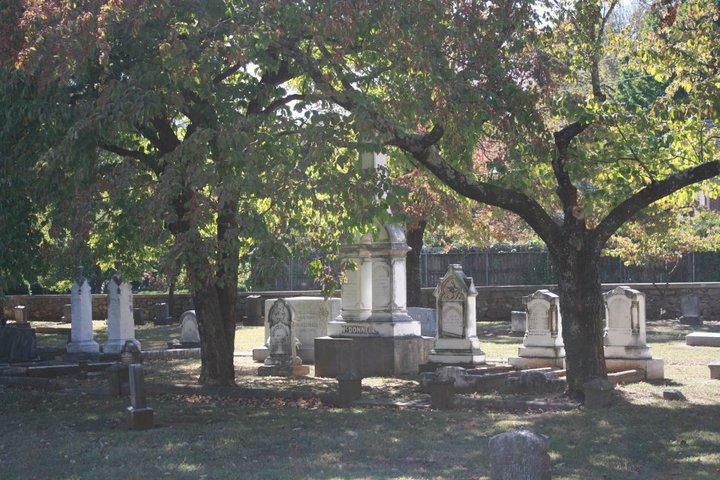 September 3, 1818, Leroy Pope sold 2 acres to the Huntsville City Commissioner for $75 for use as city burial grounds. Leroy Pope sold an additional 2 acres which would become Maple Hill Cemetery, at which point the original 2 acre cemetery was earmarked as a slave graveyard and was known as the Old Georgia Graveyard, likely in association of the numerous slaves that migrated to Huntsville from Georgia with their owners. In 1870, Huntsville decided to move the cemetery to 10 acres between Holmes and Clinton Avenue from land originally part of the John Brahan Plantation and in 1875, additional land was added to Glenwood from the W. W. Darwin family. Since there were no burial records, it is unknown how many bodies were moved to the new cemetery, Glenwood, and how many remain. Old Georgia was located where the parking garage for Huntsville Hospital is today. The exact number of graves in Glenwood is unknown but could possible number up to 10,000 including over a thousand belonging to slaves as well as prominent member of Huntsville&apos;s African American community such as Burgess Scruggs, the first African-American physician in Alabama and one of only around 900 African American physicians in the country in 1890, Charles Hendley, Jr., editor of the influential Huntsville Gazette and principal of the first city-supported school for Huntsville African-Americans located in the basement of Lakeside United Methodist along with Henry C. Binford, C. C. Moore, Huntsville&apos;s first African-American postman, 2 Buffalo soldiers, and soldiers who fought in the U.S. Colored Troops during the Civil War. Madison County operated a poorhouse where impoverished, disabled, and other troubled members of society were housed from 1870 until 1923. When a resident passed away, they were buried nearby in unmarked graves. If you are looking for evidence of the poorhouse and those who lived in it, all that remains are the hundreds of depressions in the ground indicating the unmarked graves of those unfortunate souls. The Mount Paran Cemetery contains graves going back to at least 1826 and is the resting place for several of the early Madison County settlers. Around 400 graves are thought to be in the cemetery but only 135 still have markers including those of Revolutionary War veterans. At the front entrance of the U.S. Space & Rocket Center lies the final resting place of a tiny space adventurer. Miss Baker the squirrel monkey, along with Miss Able the rhesus monkey, was one of the first two animals launched into space by the United States and recovered alive. Years after her historic flight in 1959, she moved to Huntsville and lived out her days at the Rocket Center. If you visit her, don&apos;t forget to bring a banana to leave on her memorial.